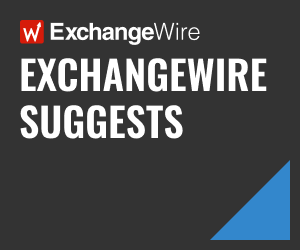 In this weekly segment, ExchangeWire sums up key industry updates on ad tech from around the Asia-Pacific region – and in this edition: APAC ad spend to climb 4.2% in 2018; AU agency ad bookings hit £4.1bn; Merkle merges with &c in China; AdAsia forms parent company AnyMind; and China social ads grow 53.7%. 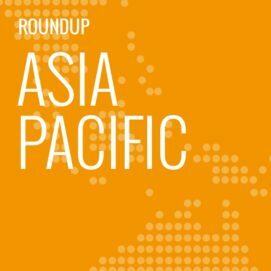 Ad spend in Asia-Pacific is expected to grow 4.2% this year, or by USD$8.1bn (£5.9bn), which is up slightly from the 3.1% increase in 2017. 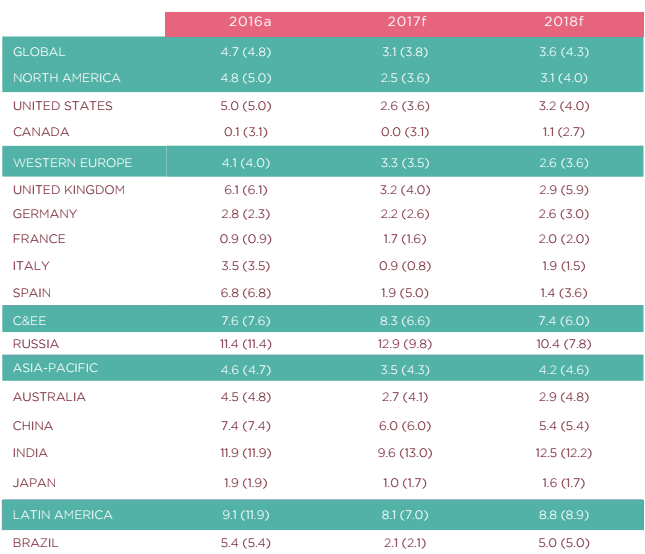 The region would be the main growth driver, accounting for 39.7% of the global growth rate, according to Dentsu Aegis Network’s Ad Spend Forecasts. Worldwide, ad spend was projected to increase by 3.6% or USD$20.3bn (£14.78bn), noted the report, which was based on data from 59 markets. It pointed to China, Japan, India, and the Philippines as key growth markets. Digital was expected to climb 12.6% this year to account for 38.3% of total spend globally, reaching USD$220.3bn (£160.38bn). It would outpace TV ad spend for the first time in 2018, which would contribute 35.5% of the overall figure. Mobile ad spend would climb 23.8% to hit USD$121.1m (£88.16m), accounting for 62% of digital spend this year. The platform surpassed desktop last year with a 57% share, compared to 43% for the latter. China would add USD$4.6bn (£3.35bn) in new ad dollars, accounting for 22.8% of the global growth and 15.2% of total ad spend. This, however, would be a dip from the 6% growth the Asian giant clocked last year; and the downward growth rate would continue into 2019 at 5.3%. In comparison, India was forecast to clock a 12.5% growth rate in 2018, up from 9.6% last year, and would continue the upward trajectory in 2019, when its ad spend would expand by another 12.5%. Digital ad spend also was projected to grow by 30% this year, while mobile would grow 43.6% to account for 47% of total digital ad spend in the Indian market. While Japan was projected to grow by just 1.6% this year, it would remain the leading contributor of global ad spend, according to the report. The growth rate was an increase of the 1% clocked last year and was expected to climb further at 2.1% in 2019. Dentsu Aegis Network Asia-Pacific CEO Nick Waters said: “With the region’s fast adoption of technology and innovation, there will be a substantial shift towards mobile and smart devices. As a result, mobile online video ads will be the main drivers of growth within digital ad spend across the region. Ad bookings by Australian media agencies have increased 0.7% to reach AUD$7.1bn (£4.1bn) in 2017, lifting the industry up from a dip in the start of the year. Digital, outdoor, radio, and cinema reported record bookings, although newspaper dipped by 20.7% and magazines also fell by 17.7%, according to the latest stats from Standard Media Index (SMI). Its data represents more than 90% of overall agency spend in Australia and is pulled from agencies’ billing systems, and aggregated to reflect ad spend across major media platforms, sectors, 40 product categories, and 126 digital product categories. 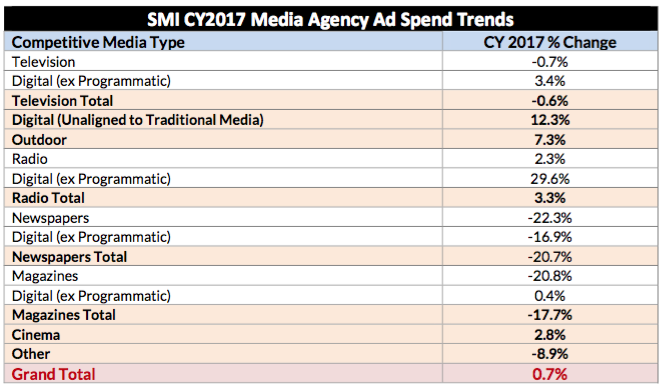 Television ad bookings also dipped 0.7% last year, SMI said, adding that demand was driven mainly from several key product categories including retail, automotive, and government. Ractliffe, though, noted that retail was unexpectedly weak, given the time of year, with total spending for December expected to drop by 7.5%. Dentsu Aegis Network has merged Merkle and &c in China to form a “fully integrated offering” that encompasses digital and performance media, analytics, customer relationship management (CRM), marketing tech, and loyalty programmes. Renamed ‘Merkle &c’, the performance marketing agency would bring together &c’s presence and reach in China as well as Merkle’s data and technology capabilities, the agency group said. Headquartered in Beijing, &c employs 300 people across other offices in Shanghai and Guangzhou. With the merger, it would add another 500 employees in the Chinese market. Merkle China’s general manager Frank Zhang added that the merger would allow both companies to “join forces” in research and development, as well as business development and solutions delivery. The Singapore-headquartered ad tech vendor has created a parent company to mark its plans to expand beyond its original industry focus. Called ‘AnyMind Group’, the new umbrella entity would encompass three companies: AdAsia, TalentMind, and CastingAsia. While TalentMind would offer human resource technology, including an artificial intelligence (AI)-powered recruitment platform, CastingAsia would focus on influencer marketing and help match brands with relevant influencers via its AI tools. He explained that the new name was chosen to reflect the company’s “focus on intelligent solutions” as well as its ability to scale into any industry. “Ultimately, we want to power businesses and professionals with a suite of AI-based solutions, enabling them to easily achieve greater scale and efficiency within and across departments”, said Sogo, who founded AdAsia in April 2016. The ad tech vendor clocked USD$12.9m (£9.39m) in revenue in 2016 and operated offices across several Asian markets, including Thailand, Indonesia, Japan, China, and Taiwan. It planned to open new offices in Malaysia and Philippines this quarter, as well as India, Russia, and the United Arab Emirates by the end of 2018. Social network ads in China increased 53.7% year-on-year to generate ¥10.4bn (£1.17bn) in revenue for the third quarter of 2017. These platforms continued to offer different native ad formats, moving from image and text to video, according to iResearch, which added that “short-video marketing” also had emerged as a new marketing tool. The introduction of new offerings in native ads would continue to drive the market segment, the research firm said. It noted that monthly unique devices with social apps had grown steadily since January 2017, with the exception of a slight dip in June.